World-leading healthcare and IT professionals, managers, academics, companies and universities, suppliers and users from both the public and the private sector are coming together to discuss ideas, fundamentals, applications and policies related to Health Informatics in Brazil and the world. The congress is organised by the Brazilian Society of Health Informatics - SBIS, along with the Federal University of Goiás - Governance Committee of Health Information (CGIS-UFG), and held on November 27-30 in Goiânia, Brazil. With the central theme of the congress being "Transforming Health Informatics", Marand will be presenting its “Integrate. Open. Innovate” vision for healthcare IT. Our Think!EHR™ Platform is well aligned with this vision as it uses IHE-based standards to Integrate existing devices, systems and data. By storing data in an Open, vendor-neutral format it enables ecosystems of vendors to Innovate. Improving interoperability and setting up Postmodern EHR solutions is crucial for a faster development of new and innovative healthcare apps and solutions. Visit us at our stand (no. 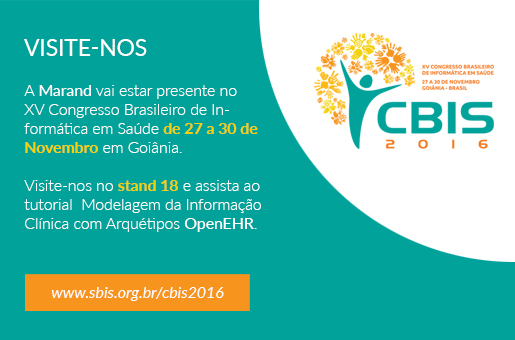 18), November 27-30, in Goiânia Convention Center to find out how to leverage our products in order to transform health informatics. Marand’s vision for healthcare IT is coined as "Integrate. Open. Innovate." Think!EHR Platform™ is well aligned with this vision as it uses IHE-based standards to integrate existing devices, systems and data. By storing data in an open, vendor-neutral format it enables ecosystems of vendors to innovate. This approach is fuelling next generation solutions known as the Postmodern EHRs. Think!EHR Platform™ is a health data platform designed for real-time, transactional health data storage, query, retrieve and exchange based on vendor-neutral open data standards including IHE, openEHR and FHIR.